BOSTON – Jealousy and envy, when uncontrolled, may be the two most destructive vices. 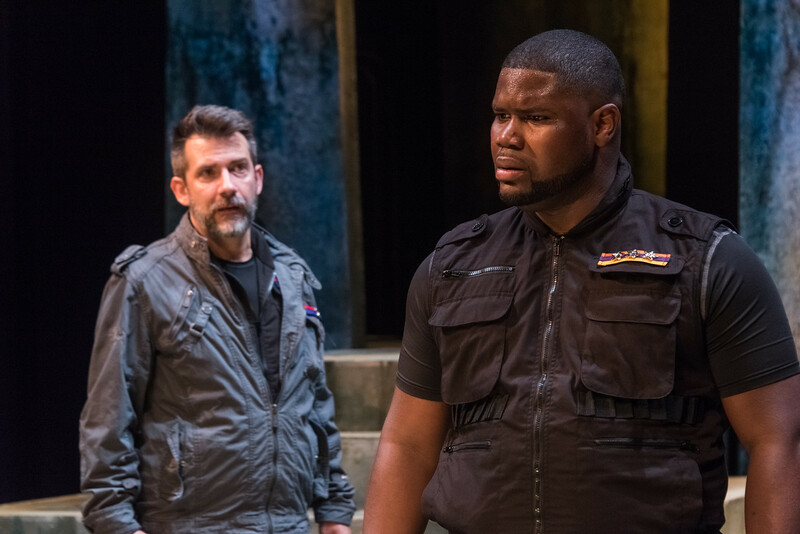 The playwright William Shakespeare knew that, and it plays out again and again in the tragedy that is the Actors Shakepseare Project’s production of “Othello,” now at Suffolk University’s Modern Theatre. The tale of the Moorish general whose happiness is derailed by a scheming underling really is Iago’s play more than Othello’s. 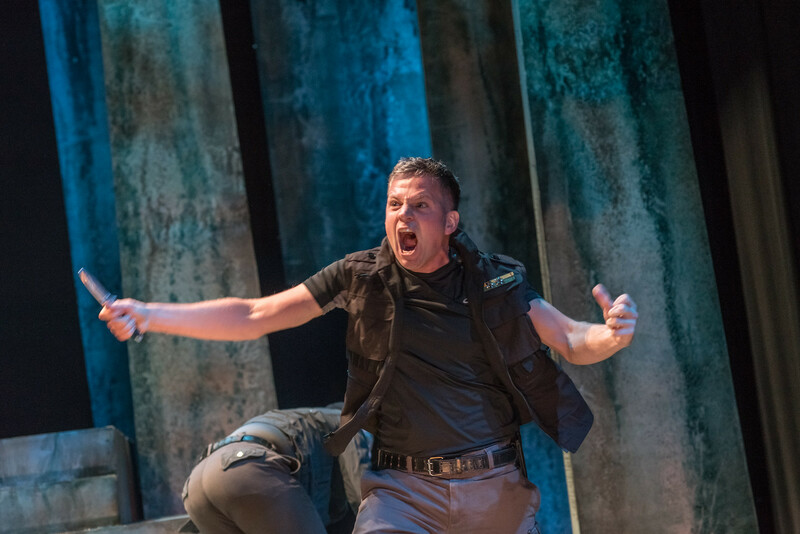 Iago is perhaps Shakespeare’s most finely-drawn villain – his perfidy is positively breathtaking — and in the hands of a skilled actor such as John Kuntz, the devastation he wreaks is both complete and unabated. Thankfully, casting has come a long way in the half-century since I first saw “Othello” as Sir Laurence Olivier donned blackface to portray the Moor in the 1965 film of the National Theatre Company production that also starred Maggie Smith, Joyce Redman and Frank Finlay. Johnnie McQuarley has been an ASP mainstay for several years and he is a perfect fit as a man whose military successes, while celebrated, have also left him – as an outsider, and black to boot – dangerously vulnerable in the city of Venice. McQuarley’s Othello is a soft-spoken and seemingly reasoned man but there is a sense of uneasiness. His marriage to the lovely Desdemona (Josephine Elwood) has angered many in the city, including Roderigo (Bari Robinson), who formed an alliance with Iago in his pursuit of Desdemona. But Iago cautions him that, despite the marriage, he may yet have his prize. Th source of Iago’s enmity is seemingly his anger over being passed over for promotion in favor of the less-experienced Michael Cassio ( Ross McDonald), but it would seem that he comes about his treachery quite naturally. Cassio is relentless in his bid to again be in Othello’s good graces after Othello has stripped him of rank after a fight instigated by Iago. Iago’s machinations even extend to Jennie Israel as his wife Emilia, an attendant to Desdemona who will also play a part in Iago’s grand scheme via a certain handkerchief. McQuarley simmers and stews, the rage and anger building until they combine to finally become despair, as Iago pulls the strings in the background, moving the characters around the board as if in a deadly chess game. The charm and humor of Ross McDonald’s Cassio – a handsome, hale fellow well met – makes it easier for Othello to believe that he might charm and seduce Desdemona. She is the very model of innocence and trust but Othello – goaded by Iago – seizes on n a fleeting clasp of hands, or a handkerchief. Desdemona’s entreaties on Cassio’s behalf also stoke Othello’s suspicions. Along the way, Iago will confide in us what must do in order to ensnare his victims. Director Bridget Kathleen O’Leary’s direction has us honing in on the core of the story with few distractions, although she tinkers with the roles of Montano and Brabantio, the father of Desdemona. They become the female roles Montana and Brabantia, a change that is puzzling at best. The Bard intended this tragedy to be multi-layered. Besides the obvious racial aspect of the piece, it is also a commentary on the havoc that military men cam wreak when they put down their arms and attempt to rejoin civilization. Eric Levenson’s set is a series of pillars and stairs, the four tall pillars melding with Chris Brusberg’s multi-hued lights, while Tyler Kinney’s costumes work best as modernist military dress. Kuntz’s Iago is able to take advantage at every turn of the worst parts of us. When he pushes buttons and Othello responds – not with his innate good nature but as a man gripped by jealously and a sense of betrayal – trust and love vanish in a heartbeat. And when that happens, no one’s life is safe. The Actors Shakespeare Project’s production of William Shakespeare’s Othello. Directed by Bridget Kathleen O’Leary. At the Modern Theatre through Oct. 25. actorsshakespeareproject.org.